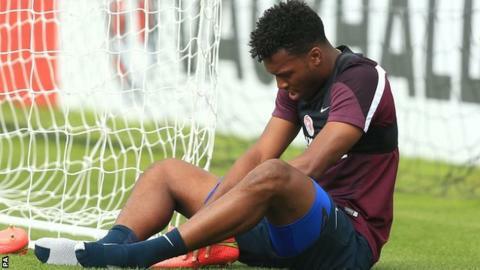 Striker Daniel Sturridge says he is heartbroken after being ruled out of England's opening Euro 2016 qualifier against Switzerland on Monday. The 25-year-old injured his thigh during Friday's training session at St George's Park. The Football Association confirmed that the Liverpool player will miss next week's game in Basel. "Heartbroken soul right now," he tweeted. "Nothing worse than being injured." Sturridge added: "Hopefully be back soon fighting fit for LFC." An FA spokesman said: "Daniel Sturridge has had a scan and will now return to Liverpool FC for treatment. He will play no part in the forthcoming Switzerland match." Sturridge, who has scored five goals in 16 international appearances, left Liverpool's pre-season tour of the United States early after injuring a hamstring. He played in the Reds' first three Premier League matches, scoring the winner in the 2-1 opening-day victory over Southampton. England manager Roy Hodgson will have captain Wayne Rooney, Liverpool's Rickie Lambert and new Arsenal signing Danny Welbeck as his remaining attacking options. Chelsea central defender Gary Cahill believes the game will be one of England's toughest tests in a qualifying group also featuring Slovenia, Estonia, Lithuania and San Marino. The 28-year-old asked for supporters to show patience as England seek to rebuild following their early World Cup exit and the international retirements of experienced midfielders Steven Gerrard and Frank Lampard. "Switzerland will be confident, but it is a great opportunity to bounce back from a disappointing summer," he said. "Turning around our fortunes is not going to happen overnight - everyone knows and expects that."